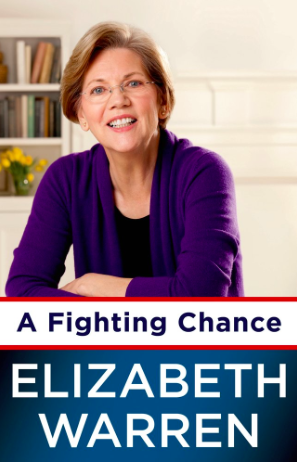 Elizabeth Warren’s AFighting Chance is must reading for all American citizens but especially for mothers, for dog lovers, and for anyone who thinks they have gotten a raw deal from those who control this country’s economy. The book is like a rolling ocean wave. It crests and lets you float along, suspended between earth and sky; it drops you unexpectedly, and leaves your eyes wet with tears; then ultimately it washes over you and pulls you under. The crests of the book are those vignettes that tell Senator Warren’s story. The style is conversational and makes the reader feel like she is sitting at the Senator’s dining room table sharing a beer. Her infectious optimism seeps into the pores and carries her reader along. The low points as a reader are the stories of the people she has met, the people who are struggling, the people for whom she has so much passion. There are many tears to be shed while reading this book, both for the struggles of those who are hurt by the current direction of the country and for those moments of nobility of human spirit that raise you once again to the crests. Ultimately, however, this book sucked me in. The arguments are clear and well-reasoned, and Senator Warren’s passion washes over every page. It is hard not to want to march right behind her wherever she goes. The only negative with A Fighting Chance is the fact that it was extremely difficult to put down. I had thought that the short, readable sections would make it easy to read piecemeal but the energy and story-telling power of the book made that impossible. Senator Warren, I would have a beer with you any time.